I realized that many of the strategies I’ve shared here are not really workable for everyone. So, this week, the round-up is all about the folks who don’t live on a few acres in the country. The Self-Reliance Weekly Report is a collection of strategies, made up of the articles, books, DIYs, and products that I found useful on my own little prepper’s homestead. Are you new to prepping? Here’s a quick start guide that will cover all of your basics in a very small amount of space. 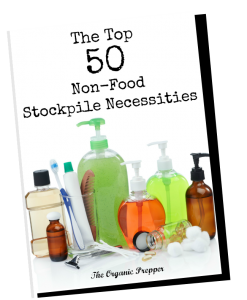 This book will help you build a prepper’s pantry regardless of your budget, and it includes a section on where to stash all of your stuff. In smaller spaces, keeping your preps organized is even more essential – check out these organization hacks just for preppers. Don’t let people tell you that if you live in the city, you are certain to die in a disaster. Yes, being right in the middle of an urban center will be a lot more dangerous than the suburbs or the country, but no matter where you live if you embrace where you are right at that moment, you can greatly improve your chances. While many preppers choose to live in the country, you might be surprised to find that there are actually a lot of advantages to being in the suburbs. Finally, if you are just getting started, this book will guide you through it, from the very first moment you dip your big toe in the water all the way through your journey to self-reliance. Are you worried that you don’t have the money to prep? Here are 3 easy steps to get going (and two of them are FREE!) If your budget is tight, you can still prep. With tax refund season on the near horizon, you can invest that lump sum in preparedness. Want to get the most bang for your bucks? Here are 100 inexpensive preps that you can fit into almost any financial plan and this list contains 10 crucial items that every prepper must have at the bargain price of $10 or less. Finally, here’s a list of 50 non-food items that every prepper should stock up on. Remember, these items will never be a waste. They aren’t just for the unlikely event of an epic long-term scenario worthy of the movies. They are your insurance against personal disasters like job loss or unexpected expenses. What can we learn from the events in Venezuela? Last week, I wrote about the fact that the Venezuelan government has announced that they don’t have enough food for all of the citizens. It really got me thinking about self-reliance. If you try to become self-reliant after a disaster, your chances of thriving are far lower than if that is already your lifestyle. Self-reliance strategies for small spaces are every bit as essential whether you’re living in the city or 5 miles from town on acreage. This year, my goal was producing more of our own food, but last summer taught me the painful lesson that it isn’t always as easy as it’s cracked up to be. My garden was a complete flop, and raising meat is definitely not an instant gratification kind of thing. Here are some great tips from a lifelong farmer about post-apocalyptic gardening. If you have a small yard, square foot gardening is where it’s at. When your yard is tiny, you have to focus on self-reliance strategies for small spaces. The most productive way to raise food is with the square good gardening method. This article explains how square foot gardening works to efficiently use your available space and get the most production. Then, go to this post and learn from Jane’s square foot gardening mistakes before you start planting. If it seems like square foot gardening is for you, this book provides the ultimate guide. If you don’t have a yard, you can use a balcony, patio, or even your front steps for growing. This article is a guide to growing a salad bar in pots right on your front steps. Then, check out this round-up of all of the best tips for container gardening. If you happen to be using the front of your home for growing food, this book teaches you how to sneak in some edible plantings without inciting the wrath of your HOA. The great thing about container gardening is that you can take your little farm with you when you relocate. Are you considering backyard chickens? If you want to get along peacefully with your neighbors, you should consider sharing your fresh eggs and going with the breeds that tend to be a little quieter. Here’s a quick guide to the softer-spoken members of the hen world. Bear in mind that nothing will make a neighbor more irate than coming home to a chicken feasting in her flower beds. Trimming the flight feathers is much easier that you might expect. Here’s how you clip a chicken’s wings to help keep them in their own yard. Be aware that even in the city, there are hungry predators from which you must protect your chickens. Finally, here’s a round-up with all of the best chicken resources. Dust masks are great to keep on hand to avoid inhaling particulates. While these aren’t as high quality as the N95 masks (this is the one I recommend in the event of an airborne pathogen or a pandemic) an inexpensive dust mask is all you need for cleaning dusty areas, as well as protecting your lungs if you happen to be sanding wood or grinding metal. The Pantry Primer is a great book to help you build a pantry, even when you are on a tight budget. (Full disclosure – it’s my book). The book outlines my family’s journey of rebuilding our food storage from square one. It includes helpful tips for budgeting, home preservation, and the importance of building your pantry using whole food ingredients instead of processed foods. Full disclosure: I own the first edition of the book, but I’m recommending the second edition. In All New Square Foot Gardening, Mel Bartholomew has refined his techniques and added a section on vertical gardening, which is essential for the small space homesteader. As well, the pest control section has also been expanded. This comprehensive book is a thorough guide to preparedness. 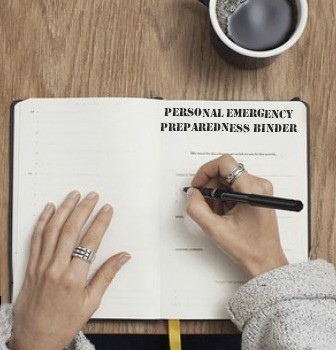 Whether you are just starting out or you’ve been at it for a while, you can learn plenty from this giant book of prepping. It runs the gamut of scenarios, and even includes news reports that emphasize the reason behind certain aspects of preparedness. The Prepper’s Blueprint a must-have for any prepper’s library. Even though it feels like spring and some early daffodils are up here in California, I’m sure we’ll get hit with another cold snap soon. My daughter and our dog Thor enjoyed an afternoon outside, and it is so close to flip flop weather she gave herself a pedicure. Our focus right now is on packing for our move, designing our farm set up at the new place, and prepping for a new bout of El Nino rainstorms in the hopes that we can keep the septic from backing up into the house again. Ever since the first incident, my asthma (which rarely acts up these days) has been absolutely horrible, so I decided to look like a dork and wear the dust masks that I keep in my preps to avoid inhaling dust while we were packing up the storage area. Our chickens are really getting it in gear with the warmer, sunny spring-like weather. When I got my baby chicks, I went with all different breeds so that I could have lots of different colored eggs. Here’s a handful from the other morning. Aren’t they pretty? After the hullabaloo with the mandarin oranges being grown using oil-industry wastewater, I feared that our mini-citrus days were over. Then we found a lady in the area with a small organic citrus orchard that was selling her harvest for a great price. We got 10 pounds of these delicious little beauties and the flavor is so intense and delicious that it completely blows away the stuff you get at the store. I’m going to have to whip up some marmalade, though, because I didn’t realize exactly how much “10 pounds of mandarins” would actually be. What’s going on at your farm or urban homestead right now? How’s the weather in your area? Are you getting a warm spell too? Please share your updates in the comments below!